The transmission routes of trachoma, a blinding eye disease, are still not fully understood. Some evidence points towards transmission by a disease vector - Musca sorbens, the fly that visits eyes to obtain liquid or nutrition. Musca sorbens, the 'Bazaar Fly", feeds on eye and nose discharge for liquid and protein. Trachoma is the leading cause of infectious blindness in humans, and an estimated 1.8 million people are visually impaired from this disease worldwide. Trachoma occurs because the intracellular bacterium Chlamydia trachomatis (Ct) has infected cells in the mucus membranes of the eye (the conjunctiva) – the same species, but a different strain, to that which causes the sexually transmitted infection chlamydia. Although treatable with antibiotics, repeated infection with Ct can result in progressive damage to the eye, and eventually blindness. Trachoma is endemic in 41 countries across Africa, the Americas, Asia, the Middle East and Australia, and is a neglected tropical disease, affecting the world’s poorest and most marginalised populations. The bacterium Chlamydia trachomatis is interesting biologically, as it’s lifecycle includes the production of spore-like ‘elementary bodies’ (EB). These are small, environmentally resistant, infectious particles, which are easily spread from person to person. Three primary routes for the transmission of Ct have traditionally been cited: fingers, fomites and flies. It is thought that the EBs are easily transmitted through human touch (e.g. fingers that have previously wiped a weeping eye), or contact with some non-living, but contaminated, particle (a ‘fomite’, e.g. bedding). There are several lines of evidence that trachoma is also vectored (transmitted) by flies that are attracted to and feed on discharge from people’s eyes. In reality, the transmission of trachoma remains poorly defined, with different routes seemingly more or less important in different geographic regions. The current WHO-endorsed trachoma control ‘SAFE’ strategy (Surgery for late-stage disease, Antibiotics to stop infection, Facial cleanliness and Environmental management) aims to target all of these, although as described in a previous BugBitten blog, there is mounting evidence that this is insufficient. The fly species that is considered a likely vector of trachoma is the Bazaar Fly, or Musca sorbens, found widely in Africa, Asia and the Pacific. Female M. sorbens feed on ocular (eye) and nasal (nose) discharge in order to obtain sufficient protein to develop eggs, just as female mosquitoes take a blood meal for the same purpose. It is thought that when feeding, M. sorbens picks up EBs and then carries them from person to person. The transmission of Ct by M. sorbens has never been definitively demonstrated, however, three primary strands of evidence incriminate this fly. Female M. sorbens lay their eggs on faeces, and their stool of choice is human. Incidentally, it is tempting to speculate that this has had a direct influence on the paucity of research on this species. A study in the Gambia showed that controlling local populations of M. sorbens, either by mass spraying of insecticide, or by the provision of latrines, caused a reduction in trachoma prevalence. Because M. sorbens prefers exposed human faeces (e.g. open defecation), latrines do not present a suitable breeding habitat, and so provision of latrines can control population densities. The same study showed a decrease in fly-eye contacts (counting the frequency and/or duration of fly-to-eye contacts on the local human population) after both interventions, therefore providing compelling evidence that these fly control interventions decreased trachoma prevalence by reducing the availability of flies to transmit the disease. Studies that have examined the association of trachoma with common factors (‘risk factor’ analysis) have found the use of latrines to be associated with a decreased risk of trachoma, while the presence of flies on the face has consistently been associated with an increased risk of trachoma. Further evidence for the transmission of Ct by M. sorbens comes from studies that have caught flies as they leave faces, and subsequently tested these flies for the chlamydial bacterium. In two studies conducted in The Gambia and Ethiopia, the presence of Ct DNA was detected on 0.5 % and 14.6 % of these flies respectively. While these numbers may appear low, our current research team at Stronger SAFE is generally scoring over 100 fly-eye contacts on a randomly selected child in ten minutes: 10 per minute. In this context, even at a relatively low fly ‘infection’ prevalence, contact with a Ct-harbouring fly will be frequent. Further, in a region where malaria is prevalent, of the total Anopheline mosquito population (the species responsible for transmitting malaria), the percentage of those carrying human-infectious malaria parasites can hover at less than one percent: a small proportion can have a devastating impact. Musca sorbens has not yet been incriminated as a vector of trachoma by rigorously designed transmission experiments, however, such studies were conducted in 1981 using the closely related species M. domestica (the housefly). Having infected the flies by feeding them on Chlamydia-contaminated egg yolk cells, the flies were then dissected into legs, proboscis (mouthparts) and intestines, and these body parts analysed for the presence of Ct at time intervals, over ten days. Because Ct lives inside cells, it is possible that this bacterium is actually able to infect, and replicate within, some body tissue of the fly. Chlamydiae were detected on both the proboscis and mouthparts during feeding, but also within the flies’ intestines for up to 6 hours after removal of the Ct-contaminated food. Further, the authors demonstrated transmission from guinea pigs with chlamydial infection to uninfected individuals, only by confinement with M. domestica. While the above makes a compelling case for the role of M. sorbens in transmitting trachoma, a further study in Tanzania did not find evidence for transmission by flies. 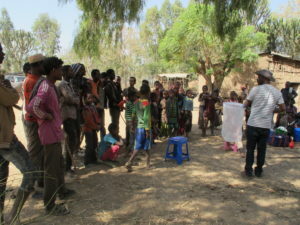 Stronger SAFE, a research project based in central Ethiopia (Oromia), aims to adopt a rational approach to trachoma control by first defining the local transmission routes. We will then design a contextually-appropriate disease control strategy, that aims to block these routes at the same time as identifying and treating infected individuals: an enhanced ‘SAFE’ strategy. Ailie is interested in the biology and ecology of medically important insects, and exploiting aspects of this for novel methods of monitoring and control. She currently studies Musca sorbens flies for trachoma control on the Stronger SAFE project.